The remote, high altitude area of northern India occupies 96,701 sq km (including Aksai Chin) of the eastern half of the Indian state of Jammu and Kashmir is called Ladakh. It is bordered on the northwest with Pakistan; the north with the Chinese province of Sinkiang; and the east with Tibet. The capital city of Leh lies at an altitude of 3500 meters and it is also the largest population center, about 25,000 residents. Many books have been written about this fascinating and remote area in the Himalayas. Short descriptions of the following subjects should provide you with basic knowledge, and hopefully encourage you to visit Ladakh to learn more. Ladakh translates to Land of the High Passes, and it certainly merits this name with its multitude of towering mountain ranges, river valleys and high plateaus. The Karakoram Range isolates the northern border and contains the highest peak in Ladakh, Saser Kangri at 7672 meters (25,164 ft). The Himalayan Range along the southern and eastern border contains two 7000-meter peaks, Nun and Kun. Popular trekking peaks are Stok Kangri (6121 m) in the Stok Range and Kang Yatse (6401 m) in the Zanskar Range. 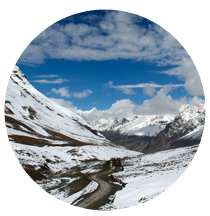 Routes over the high passes of Ladakh were established centuries ago by the caravan traders and by the local people. Some of these routes have been developed into motorable roads. The road from Srinagar to Leh via Kargil crosses the Himalayas over the Zoji La (pass) at 3530 m, and then over the Namika La at 3719 m and the Fotu La at 4094 m before descending by the Lamayuru Monastery and down into the Indus Valley. The road from Manali must cross the Lachlung la at 5060 m and the Taglang La at 5328 m. The world’s highest motorable road from Leh to the Nubra Valley crosses the Kardung La at 5602 m (18,375 ft). The road from Kargil to Padum in the Zanskar Valley must pass over the Fentse La at 4450 m.
Several major river systems flow through Ladakh. The mighty Indus River enters Ladakh in the east, from its origin near Mt. Kailas in Tibet, and flows to the western side into northern Pakistan, where it then flows south to Arabian Sea near Karachi. The Indus forms a broad valley about 10 kilometers wide between the Ladakh and Stok Ranges near Leh. In Zanskar, located between the Zanskar and Himalayan Ranges, the Stod and Tsarap Rivers join to form the Zanskar River, which eventually cuts through deep gorges in the Zanskar Range and flows into the Indus River at Nimoo. The Shyok River flows south from its origin in the disputed area of Aksai Chin (now under Chinese control) and then turns northwest, flowing between the Ladakh and Karakoram Ranges. Its tributary, the Nubra River, originates in the Saichen glacier and gives its name to the valley. The Suru River flows in western Ladakh before joining with the Drass River at Kargil and flowing into Kashmir. The high plains of eastern Ladakh contain several large brackish lakes. 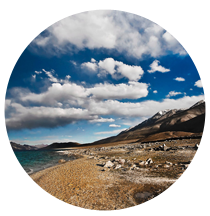 The largest is Pangong Tso (lake), which extends into Tibet. The Rupshu plains to the south contain the lakes of Tso Moriri and Tso Kar. The Himalayan range bordering the south of Ladakh blocks the monsoon rains, resulting in a stark desert environment. Rainfall in Leh averages a scant 110 mm (4.3 in) per year. In central Ladakh, the lower elevations receive only a small amount of snowfall during the winter, but Zanskar and western Ladakh can receive heavy snows. The high passes are usually closed during the winter due to heavy snow, isolating the various valleys from each other and the rest of the world. Snow can fall in the higher elevations at any time during the year. In the summer, the daytime temperature in Ladakh rises to a comfortable range in the mid 20’s degree Celsius (75-80 F), but the nighttime temperatures can be cool, particularly at the higher altitudes. In the winter the temperature rarely rises above freezing. The Ladakhis have survived over the centuries in this harsh landscape by harnessing the water from the rivers and snowmelt streams in elaborate irrigation systems. The main crop is barley, which is roasted and ground into a powder called tsampa. This was a staple food of Ladakh. The barley is also used to make local beer called chang. Other crops are wheat, vegetables, mustard, apples, and apricots. The second major source of nourishment is yak butter, which is mixed with tsampa and rolled into balls or mixed with tea and salt and drunk in the form of the famous yak butter tea. Yak cheese is also consumed. 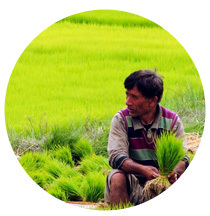 The heavy snowfalls in the winter not only provide a good water supply to the farmers, but also allow grasses and other plants to grow at the higher elevations. These provide good grazing for yaks, sheep, and goats. Wildlife is abundant in the mountains. 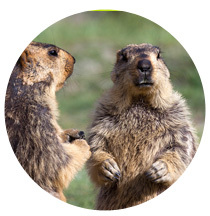 It is very common on our treks to see herds of blue sheep, some ibex, an occasional wolf, wild yaks, marmots, chukors, and birds of prey such as the golden eagle and the lammergier. Snow leopards also live in these mountains but are rarely seen due to their shyness. However, a group of trekkers with Namgial saw one cross in front of them on their descent from Stok Kangri in 2003. Herds of Kyang (wild horses) can sometimes be seen on the Rupshu plains in eastern Ladakh. Besides the highly visible golden eagles and lammergiers, and the noisy chukors, other birds are abundant in Ladakh. The migratory barheaded goose and rare black-necked crane are sometimes seen near the brackish lakes in eastern Ladakh. 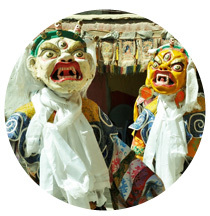 The traditional culture of Ladakh evolved from Tibetan Buddhism. Evidence of this can be found in the many, centuries old, monasteries that are found in almost every village throughout Ladakh. A large population of monks provides for the religious and spiritual needs of the people, and are the most respected members of society. Most Ladakhi homes have a small chapel, even in the tents of the nomads, containing various religious objects and sacred images. Other visible signs of the Buddhist faith are prayer flags, stupas and mani walls. An infusion of more Tibetans has occurred as a result of the Chinese invasion of Tibet in the 1950’s. The people in the Dha Hanu area and around Drass descended from the Buddhist Dards, who originated in Gilgit, Pakistan. Those in the Dha Hanu area are called Brokpas and still practice their Buddhist faith. Those around Drass have converted to Islam under the influence of nearby Kashmir. In Kargil and the Suru Valley, the population is predominately Baltis. This area was part of Baltistan until 1947. They have Tibetan origins, but were converted to Islam in the 15th century and the majority of them are Shiite Muslims. With its history as a trading center on the old caravan route, Leh has a mixture of cultures living and working together. The most recent addition to this mix is the Indian Armed Forces. With its location on the western edge of the Tibetan plateau known as the Chang Tang, Ladakh’s first inhabitants were probably the nomadic Changpas from western Tibet looking for good grazing for their herds of yak and sheep on the high plateaus of eastern Ladakh. The Mons, Aryans from northern India, moved into the valleys. The Dards, Aryans from Gilgit, followed the Indus River upstream into Ladakh. These groups were later overwhelmed by a large Tibetan migration after the breakup of the Tibetan empire in 842. 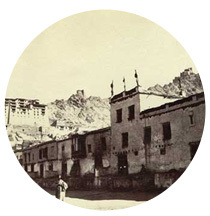 As a result of an ensuing power struggle among the Tibetan aristocracy, some members of the royal class migrated from central Tibet to the western region to establish their own kingdoms. Nyima-Gon, a member of the ancient royal house gained control of Guge, Perang, Ladakh, Zanskar, and Spiti. He gave Ladakh to his eldest son, Pal-gyi-Gon, who installed himself as Ladakh’s first king. Ladakh was now aligned with Tibet, but existed as an independent kingdom from about 950 AD until 1834, when it was invaded by the Hindu Dogras. Ladakh, as well as Baltistan, then became part of the maharajah’s state of Jammu and Kashmir until the Indo-Pak war in 1947. Evidence of Ladakh’s period as an independent kingdom still exists today. The first king, Pal-gyi-Gon, ruled from Shey, 15 km upstream from Leh. The ruins of an early fort still exist above the Shey Palace, which was the home of the Kings of Ladakh until the capital was moved to Leh in the late 1500’s. At one point Ladakh was divided into two kingdoms with the upper kingdom being ruled from Shey and the lower kingdom ruled from Bazgo. The ruins of the Bazgo palace can still be seen above the present day town. The nine-story Leh Palace dominates the town of Leh. It was the home of the kings of the Namgyal dynasty that still exist today. The Lower Ladakhi king overthrew the Upper Ladakhi king and united the two kingdoms in 1470 to better defend the area from the ongoing Muslim invasions. He took on the name Namgyal (meaning victorious). Later, King Tashi Namgyal (1555-1575) was more successful in repelling the invaders. He built the Victory Fort along with the Temple of the Guardian Deities (Gonkhang) on Namgyal Peak above Leh. The Baltistan Muslims, led by Ali Mir, rolled through Ladakh in the early 17th century destroying all Buddhist religious objects, including most monasteries, in an attempt to convert the Ladakhis to Islam. The reigning king, Jamyang Namgyal, was forced to marry Mir’s daughter to ensure future Islamic kings. However, the Ladakhis’ strong Buddhist faith was impossible to conquer, and the royal son, Sengge Namgyal became known as the “Lion King” (1616-1642). He built the impressive Leh Palace and several monasteries including Hemis. He expanded the kingdom into Zanskar, Spiti and Guge in Tibet. He was defeated in his attempt to regain the western Ladakh provinces by the Mughal-Balti army. In 1639, he achieved peace by promising to pay tribute to the Mughal Empire through the governor of Kashmir. His son, King Deldan Namgyal, was forced to build the mosque at the north end of the Leh bazaar and to actually pay some of the promised tribute to placate the Mughals. Meanwhile, the fifth Dalai Lama was not happy with the Ladakhi King’s support of Bhutan and his association with the Mughals. In 1679 he sent a combined Mongol-Tibetan army to conquer Ladakh. They overthrew the Ladakhi resistance at Guge and pushed the Ladakhi army all the way back to the fort at Bazgo. Here the Ladakhis held them off for three years until the long requested Kashmiri army showed up and forced the Tibetan army to withdraw. As a consequence, King Deldan Namgyal was forced to convert to Islam (at least in words) and send one of his sons to Kashmir as a hostage to be brought up as a Muslim. The King also had to concede a monopoly to Kashmir on the purchase of pashmina wool for their shawl industry. On the other hand, Guge and Ruthok, two provinces in western Tibet, were ceded to Tibet as a result of the Temosgang treaty in 1684. So, Ladakh had to pay dearly in the 1864 treaty to both the Mughals as well as the Tibetans. In 1834, the Raja of Jammu, the Gulab Singh, sent his Dogra army under the command of Zorawar Singh into Ladakh through Zanskar. They marched up to Kargil, and eventually all the way to Bazgo with little resistance. There the Ladakhi King agreed to an annual tax, and to become part of the maharajah’s state. The royal family was given the present Stok Palace. After the easy victory over Ladakh, the Dogras then conquered Baltistan. They then set their sights on the former Ladakhi controlled Kingdom of Guge. In 1841, they marched up the Indus valley from Ladakh with new recruits from the conquered territories. They plundered the monasteries and forts on their way to western Tibet, all the way past Lake Manasarowar, including Mt Kailas. The Dogras now had complete control over the pashmina wool producing areas. However, The Tibetans, with backing form the Chinese empire, sent 10,000 troops to regain their territory. In the ensuing battle, Zorawar Singh was killed and the few surviving Dogras fled back to India. Encouraged by the hope of regaining their independence after the death of Zorawar, the Ladakhis blockaded the Dogra garrison in Leh in 1842 and declared Jigmet Namgyal as their king. They were reinforced from Baltistan and from a contingent of the Tibetan army. The Dogras responded by sending a 7000-man army with cannons. Faced with such firepower, the Ladakhis slipped back to their villages and the Tibetans fled to the east with the new king to join the rest of their army waiting for them near Pangong Lake. The Dogras pursued them and defeated them in battle, avenging the death of Zorawar Singh. A peace treaty between the Dogras and Tibetans was agreed to in 1842. The Treaty of Leh restored the border back to where it was in 1840, and still is today. The Tibetans agreed that the Dogras were the legitimate rulers of Ladakh, while the Dogras abandoned all claim to western Tibet. Jigmet Namgyal and his family were allowed to reside peacefully in Ladakh in the village of Stok. Today, the royal palace there contains a museum with royal family artifacts, photos and old Thankas. When the Dogras purchased Kashmir from the British in 1846, Ladakh became part of the new entity of Jammu and Kashmir and has remained so ever since. Under the Dogra rule, Ladakh’s relations with Tibet and central Asia were allowed to continue. The Buddhists still looked to Lhasa for religious guidance. The centuries-old caravan trade continued with loads of pashmina, tea, silk, silver ingots and other goods crossing and re-crossing Ladakh. Leh was the center of this trade with its colonies of merchants from Yarkland, Kashmir, Punjab and other areas. This was all changed by the overt actions of the Chinese. In 1949 they closed the border between Nubra and Sinkiang province, cutting off the trade route between India and central Asia. The Chinese invasion and occupation of Tibet in the 1950s closed the Tibetan border. It remains closed today. They moved into and occupied 28,500 sq km of Ladakh’s Aksai Chin area. In 1962 they attacked Ladakh’s borders, but were stopped by the Ladakhi militia. In response to the attack by China and earlier skirmishes with Pakistan, India began to establish a large military presence in Ladakh, and built a motor road between Srinagar and Leh. In 1974, Ladakh was opened for the tourists, and tourism along with the army provides employment and other opportunities for the local people of Ladakh. With the State Government of Jammu and Kashmir located in Srinagar since independence and dominated by Muslims, Ladakhis felt that they were neglected and demanded a Union Territory governed directly from New Delhi. Separation of Ladakh into two districts in 1979, the Buddhist Leh District and the Muslim Kargil District, did not help, particularly since Buddhist Zanskar was part of the Kargil District. Finally, in 1995, the Indian Government approved the formation of the Ladakh Autonomous Hill Development Council, which gave Ladakhis in the Leh District some administrative and financial powers to develop their old and rich culture. The earliest inhabitants of Ladakh probably practiced some form of a primitive Bon religion based on shamanism and animism. The ibex was probably an important religious symbol as evidenced by the many ancient rock carvings. This religion held the belief that all beings in the universe had souls, and that spirits were present in natural phenomena like trees, mountains, springs and lakes, all of which demanded to be appeased. Over time Bon became more unified and formal. It is believed that important aspects of this religion, such as practices for invoking the gods and rites for exorcising evil spirits, migrated from Shang Shun and Central Asia before the introduction of Buddhism. Then as Buddhism developed in the Tibetan areas, Bon also developed into a similar system of higher doctrines, ritual texts, and monastic practices. The Bon religion survives until this day. The 14th Dalai Lama has now recognized Bon as the fifth Tibetan religious school, along side the Nyingmapas, the Sakyapas, the Kagyupas, and the Gelukpas, and has given the Bonpos representation on the Council of Religious Affairs at Dharamsala. Buddhism spread into Ladakh from Kashmir perhaps as early as the first or second century AD, and flourished in the area around Kargil. Kashmir had become an important center of Indian Buddhism. When the Tibetans overtook Ladakh in 950 AD, they brought with them the Tibetan Buddhism that had originally come from India through the efforts of the Tibetan Kings Songsten Gampo in the seventh century and Trisong Detson in the eighth century. It was the latter who invited several Indian Buddhist masters to Tibet, including Padmasambhava, who was highly successful in suppressing the widespread Bon religion with the Vajrayana form of Buddhism. Part of his success was attributed to the incorporation of aspects of the Bon religion, such as the fierce deities, into Buddhism. The followers of this school of Buddhism were called the Nyingmapa order. The monks wore red hats during many ceremonies. 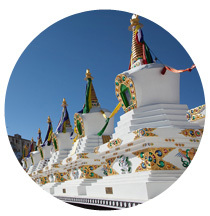 Today, the only remaining monastery from this order in Ladakh is Tak –thok. The Tibetan monarchy, who migrated to the Kingdom of Guge and Ladakh after the breakup of the central Tibetan empire in 842, looked not to Lhasa but to Kashmir for help in establishing Buddhism in their new kingdoms. Yeshe O, King of Guge, sent a number of his young scholars, including Rinchen Zangpo, to Kashmir and other centers of Buddhism in northern India to study the religion, and then return and spread it in western Tibet. He also invited the great teacher, Atisha, who was greatly responsible for reestablishing the Vajrayana form of Mahayana Buddhism in Tibet. He formed the Kadampa monastic order that was the precursor to the Gelukpa order. The Indian sage Naropa was thought to have established the first monastery in Ladakh at Lamayuru in the 10th century. The monastery at Alchi, with its Kashmiri style of artwork, is probably the best surviving example of the Indian Buddhism iconography of that period. Many of the early monasteries in Ladakh, including Alchi, were attributed to Rinchen Zangpo, who became known as the great translator. But inscriptions at Alchi show that it was founded in the 11th century by a member of one of the Tibetan noble families that migrated from central Tibet. These early monasteries predate the formation of Buddhist orders in Ladakh. The Sakyapa sect was formed in the 11th century and named after its most important teacher. They also wore red hats. The only Sakyapa monastery in Ladakh is Matho. The Kagyupa sect, or School of Oral Tradition, was established towards the end of the 11th century. This was another Red Hat sect. Marpa, a student of Naropa, carried the teachings into Tibet and was succeeded by his disciple, Milarepa, who was also a famous poet. The next two centuries saw Buddhism become well established in Ladakh and Tibet, but pushed out of India by the resurgence of Hinduism, and pushed out of Kashmir by Islam. Ladakhi monasteries formed a strong bond with those in Tibet. This continued for the next 700 years until the Chinese occupation. The Kagyupa sect split into several other sub-sects, of which two are represented in Ladakh. 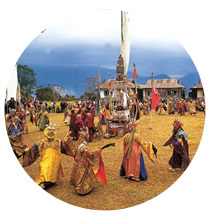 The Drigungpa order is represented by the Lamayuru and Phyang monasteries. The Drugpa order was favored by the Namgyal Kings and runs the monasteries of Hemis, Hanle, Chemdey, and Stakna. These were all founded in the 17th century about the time of King Sengge Namgyal’s reign. Meanwhile, in the 14th century, The Tibetan saint, Tsongkhapa, started a reform movement based on the teachings and monastic organization of the Kadampa order. He believed in doctrinal purity and that tantric practices should be reserved for advanced students. He formed the Gelukpa order (Model of Virtue). This is the only order that wore yellow hats. This became the predominant order in Tibet and was led by a succession of Dalai Lamas. 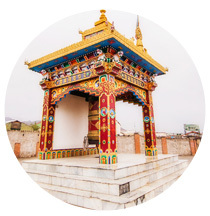 The first Gelukpas arrived in Ladakh in the early 15th century and established the Spitok monastery. The monasteries of Thiksay and Likir, which were founded earlier by the Kadampa order, were soon taken over by the Gelukpas. After escaping from the oppressive Chinese occupation of Tibet in 1959, the 14th Dalai Lama established a new center for Tibetan religion in Dharamsala, India. Major monasteries were also established in Dera Dun and Karnataka in southern India. The 14th Dalai Lama is still revered in Ladakh today, where he visits often. Throughout Ladakh’s history, Muslim invaders sought to convert the whole of Ladakh to Islam. They were only successful in western Ladakh around Kargil and Drass, where today 85% of the population is Shia Muslims with their roots in the old Baltistan. 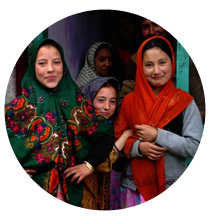 There is a small population of Sunni Muslims in Leh who are descendants of traders from Kashmir and central Asia. The Christian church came to Leh in 1885 with the establishment of a Moravian mission. They built churches in Leh and Shey. In addition to Christianity, the missionaries introduced the growing of vegetables like potatoes, tomatoes, cauliflower, and spinach. They also introduced the method of storing root vegetables in underground chambers to extend their edible life.